Recently we see computers allow natural forms of interaction and are becoming more ubiquitous, more capable, and more ingrained in our daily lives. They are becoming less like heartless dumb tools and more like friends, able to entertain us, look out for us, and assist us with our work. This article is an excerpt taken from the book Machine Learning with Core ML authored by Joshua Newnham. With this shift comes a need for computers to be able to understand our emotional state. For example, you don’t want your social robot cracking a joke after you arrive back from work having lost your job (to an AI bot!). This is a field of computer science known as affective computing (also referred to as artificial emotional intelligence or emotional AI), a field that studies systems that can recognize, interpret, process, and simulate human emotions. The first stage of this is being able to recognize the emotional state. In this article, we will be creating a model that can detect the exact face expression or emotion using CoreML. We will implement the preprocessing functionality required to transform images into something the model is expecting. We will build up this functionality in a playground project before migrating it across to our project in the next section. Before starting, to avoid looking at images of me, please replace the test images with either personal photos of your own or royalty free images from the internet, ideally a set expressing a range of emotions. Along with the test images, this playground includes a compiled Core ML model (we introduced it in the previous image) with its generated set of wrappers for inputs, outputs, and the model itself. Also included are some extensions for UIImage, UIImageView, CGImagePropertyOrientation, and an empty CIImage extension, to which we will return later in the extract. The others provide utility functions to help us visualize the images as we work through this playground. Luckily for us, Apple has mostly taken care of our first task of detecting faces through the Vision framework it released with iOS 11. The Vision framework provides performant image analysis and computer vision tools, exposing them through a simple API. This allows for face detection, feature detection and tracking, and classification of scenes in images and video. 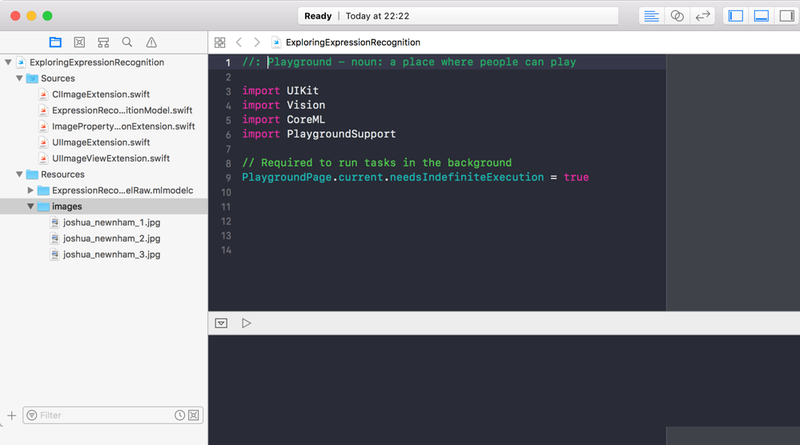 The latter (expression recognition) is something we will take care of using the Core ML model introduced earlier. 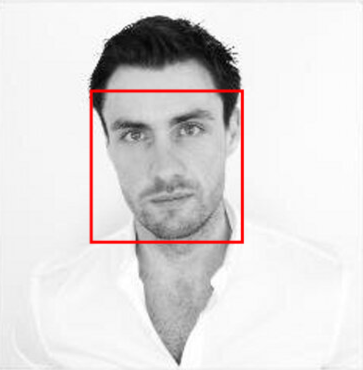 Prior to the introduction of the Vision framework, face detection would typically be performed using the Core Image filter. Going back further, you had to use something like OpenCV. 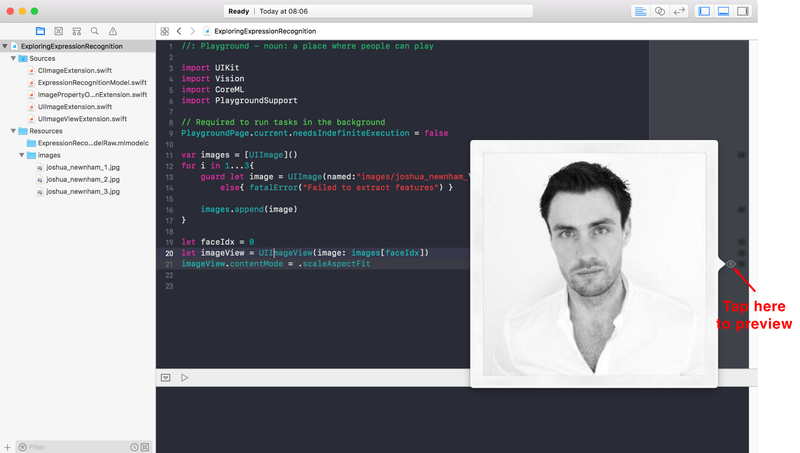 You can learn more about Core Image here: https://developer.apple.com/library/content/documentation/GraphicsImaging/Conceptual/CoreImaging/ci_detect_faces/ci_detect_faces.html. As illustrated in the preceding diagram, the request determines what type of image analysis will be performed; the handler, using a request or multiple requests and an image, performs the actual analysis and generates the results (also known as observations). These are accessible via a property or delegate if one has been assigned. The type of observation is dependent on the request performed; it’s worth highlighting that the Vision framework is tightly integrated into Core ML and provides another layer of abstraction and uniformity between you and the data and process. For example, using a classification Core ML model would return an observation of type VNClassificationObservation. This layer of abstraction not only simplifies things but also provides a consistent way of working with machine learning models. So, when do you use VNImageRequestHandler and VNSequenceRequestHandler? Though the names provide clues as to when one should be used over the other, it’s worth outlining some differences. The image request handler is for interactive exploration of an image; it holds a reference to the image for its life cycle and allows optimizations of various request types. The sequence request handler is more appropriate for performing tasks such as tracking and does not optimize for multiple requests on an image. The perform function of the handler can throw an error if it fails; for this reason, we wrap the call with try? at the beginning of the statement and can interrogate the error property of the handler to identify the reason for failing. We pass the handler a list of requests (in this case, only our faceDetectionRequest), the image we want to perform the analysis on, and, finally, the orientation of the image that can be used by the request during analysis. The type of observation is dependent on the analysis; in this case, we’re expecting a VNFaceObservation. Hence, we cast it to the appropriate type and then iterate through all the observations. We can obtain the bounding box of each face via the let boundingBox property; the result is normalized, so we then need to scale this based on the dimensions of the image. For example, you can obtain the width by multiplying boundingBox with the width of the image: bbox.width * imageSize.width. This approach leads to less code and therefore less chances of errors. So, it is the recommended approach. The long approach was taken previously to help illuminate the details. What is an acceptable threshold of a probability before setting the class as true? Can this threshold be dependent on probabilities of other classes to remove ambiguity? That is, if Sad and Happy have a probability of 0.3, you can infer that the prediction is inaccurate, or at least not useful. Is there a way to accept multiple probabilities? Is it useful to expose the threshold to the user and have it manually set and/or tune it? We briefly explored some use cases showing how emotion recognition could be applied. For a detailed overview of this experiment, check out our book, Machine Learning with Core ML to further implement Core ML for visual-based applications using the principles of transfer learning and neural networks.